Unless you have been living on a desert island for the past little while, the chances are you would have come across the lovely Nunn Design jewelry findings from a number of supply companies. This unique and quality product line was started by Rebecca Nunn. I wrote about the Washington based Becky before and raved about her resin clay tutorials. She is incredibly innovative in her approach to designing jewelry with resin clay and resin. Her collection includes gorgeous bezels. She also continues to share her tutorials - here are a number of video tutorials she made as a guest designer on Beadaholique. I've selected a few of my favorites. She makes it look so easy in her resin/crystal clay bangle video tutorial. Just fill the metal bangle channel with resin clay, stamp a design on it, colorize with Gilder's Past for an awesome design. Her faux enamel with crystal clay and resin tutorial is also cool! The resin she used here is a UV cured dimensional glaze called Gel Du Solei. If you like Gilder's Paste for coloring metal like brass, you'll like Becky's alternative with mica powder and sealant! There is also a great Faux French enamel tutorial over on their blog. What's different about this tutorial is the availability of try and buy kits. Nunn Design are again sponsoring a wonderful giveaway of their Winter Collection (shown at top) . If you'd like to win $75 worth of jewelry supplies from Nunn Design, please make a comment below. Make sure you leave contact info below if you do not have an online shop or blog. It ends in a week's time at 6 pm EST Monday, May 12, 2014 . I will pick the winner randomly and announce the results as soon as possible after. So be sure to leave a contact email if you don't have an online link or make sure you come back and check! Otherwise I will redraw in a week. Good luck! I would love the jewelry supplies, I have been playing with crystal clay and beach glass for a while now and love the idea of stamping the clay to add a new dimension to it. This is so great!!! So many beautiful pieces to try!! Thank you so much. I am a blog subscriber and just left a comment. My email is mitziec@verizon.net. I just shared the post with the Givewaway information, so extra points for me! Oh Pearl! What a fantastic giveaway! Please thank Becky for such an awesome opportunity! I would LOVE to win this! I've just begun experimenting with epoxy clay!! Would love to win this. Been wanting to try this of a while. I would love to be entered in the give-a-way. Thank you for all you do for us. I want this so much. I bought some of her products. Very good. I love her supplies! It would be wonderful to win them. I love that you've shared so many great tutorials in your post. I will for sure be checking them out in the future, as I bought some resin clay from one of the Nunn Design Team members. I love her supplies. It would be wonderful to win them! These look fantastic! Would love to win the jewelry supplies. Oh dear...another world of wonderful things to try! Please enter my name in the giveaway. I'm a blog subscriber, too. Already following on all the usual places! I love Nunn Design components and would love to win this! Thanks for the chance!! I'd love to win this - I have been wanting to try some of the Nunn Design ideas!! I have corrected the date for the end of the giveaway! It should be May 12th! Good luck everyone! I have yet to get my hands on Nunn Design components here in Germany, so, naturally I'd love to win some~! :) I follow your blog via feedly. This is another area I wish to explore!!! I would absolutely love to win this! Thanks for the contest! Good luck ALL! I love their components and products, thank you so much!!! This looks like so much fun. I would LOVE to win this giveaway. I'm a follower on twitter, on FB and this blog. Just starting in jewellery and you are inspiring and instructive. Great! Oh how I would enjoy winning such a marvelous give-away. Thank you for having it! Please enter me in the Nunn Design's Supplies Giveaway. that looks great, I never saw this material before ! I am a follower of this blog . OMG, the designs are so beautiful. I would love to wear them all.. I forgot to mention that I am a blog subscriber & follow you on Facebook. Fab giveaway -- I so want to win this one! I'd like to play with epoxy clays and Sugru as well as have some fun components for the jewellery material I'm currently hoping will grow in the garden (haven sown it, but don't trust the greeness of my fingers). This is so cool and thank you so much for directing us to these awesome tutorials. I am so interested to try out and it would be great if I win, otherwise I'll have to wait to buy the supplies. Always looking for something new to incorporate into a design. Haven't tried this resin clay yet, but it looks VERY interesting. would love to win this. this stuff is great! I would love to win. I love making jewelry. Oops, I think I posted my comments in the wrong place! So I here now..I save all of Nunn Designs email because I live to go back and look for inspiration! So many treasures! I am just finishing my last big order and would LOVE to win this awesome goody package. Been a buyer of Dunn for years! I am a huge Nunn Designs fan! Pretty please count me in! I would so love to win this! I just bought some crystal clay and can't wait to play! So many ace ideas! I especially love the faux enamelling tutorial! I really admire Becky Nunn for all she has done for the art community. When my spirit is flagging I know I can take a look at Nunn Designs and find something new to do. Wow! What fun can be had with this giveaway! I am a happy blog follower. I pinned it on my contests and giveaway board. 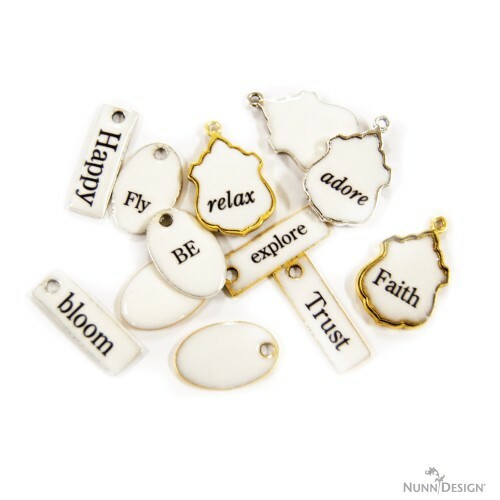 Love the Nunn Design's jewelry supplies - inspiring! Hi! I'd love to try Nunn's supplies in my designs. I shared on FB and I am a follower of your.blog. I also tweeted. Thanks for the opportunity. What great fun it would be to try some of Becky's projects! 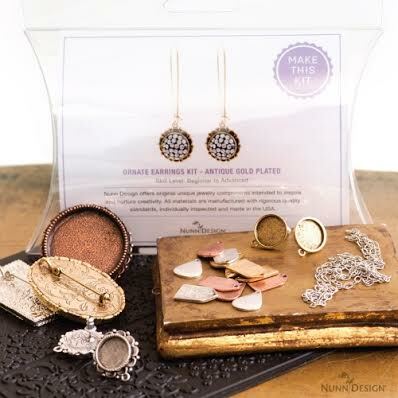 I have never used Nunn jewellery supplies before but I like the idea of their kits. Would love to win some in your fantasttic giveaway. I am an avid subscriber/follower. Hello ! I am a follower , and trying my luck again ,thanks ! I have always wanted to try out some of the Nunn products. They are so gorgeous! I follow you thru email. I would just LOVE to win this and experiment with this great product. Always something new to try. Thanks for the chance to win, I would love to play with those yummy components! I don't think I've managed to play with any of Nunn's components yet! Nor crystal clay! I am a blog subscriber and follower...LOVE Nunn bezels - started using them a few yrs ago for polymer designs. Recently, I have expanded my skill set to include metal smithing, and these new designs are something that would be great to incorporate into my work with semiprecious gem cabs and resin...and enamel...and of course, polymer! Thanks for sharing these with us!!! WOW! How awesome to have a chance to win these supplies. I absolutely love Nunn Design. I am a faithful Blog follower. Count me in, I love Nunn Design's stuff! Thanks for the links to the videos, and for the chance to win. Thanks for another opportunity to win some amazing looking products. Thanks so much for a great giveaway. Many lovely pieces to play with and love your tutes! Would love to win this and play. The textured bangle bracelet is really cool and I've always been a little afraid of the white,but to see how neat the tags came out makes me want to make some. Please cross your fingers, eyes, and everything else so I have good luck and win this one. Oops, forgot to brag. Subscriber and forever fan. Thanks for sharing these tutorials. I haven't used resin clay but it looks like fun! Thanks for the great giveaway! I follow The Beading Gem's Journal via Bloglovin. Thanks again! I'm a happy blog subscriber. I am still trying to find a store that carries the crystal clay. Would love a chance to work with it. I would love to win this giveaway. I am a subscriber. I love Nunn Design supplies!!! I love the faux French enamel look! I have been wanting to try Nunn design items and would LOVE to win! I would love the opportunity to use the Nunn Design Supplies to make jewelry that I could feature on my Etsy Shop and Facebook.. I would love to win this! I have looked at the Nunn Design products for a long time and this would be an opportunity to finally try them. Thank you for the giveaway! Dude, I love Nunn deign. Becky Nunn has come up with some of the coolest jewelry findings I have found yet. Plus, they are very high quality. Love it. Thanks, Pearl, for yet another opportunity to win cool stuff! I love her line. I have to put away a "lot" of dollars because I want to purchase her whole collection! Great giveaway!!! That bangle looks like fun to try! I love Becky Nunn's designs. They are always so original. I'd love to win a prize ;) I'm a subscriber and an FB follower. Thank you for running this contest. Sorry, my email is moushka26 at yahoo dot com. I love Nunn Design's. So beautiful and easy to use. I can craft a beautiful addition to anyone's jewelry collection with Nunn Design's cabs, findings, etc. etc. ...to numerous to mention. Thank you for allowing me to enter this giveaway contest. Faux enamel, what a wonderful technique! I hope I win! Thank you, I'd love to try these with crystal clay and chatons or mica powder. I just loved the resin/crystal clay bangle tutorial. I liked the way the stamp is used and the bangle is sooo pretty. I would certainly like to try this technique. Just shared on my fb page. Haven't tried the Nunn Design supplies yet, so this would be just fantastic! I just adore Winter Collection!! !